60 Minutes Sports investigates the controversy and legality of daily fantasy sports. Armen Keteyian reports. Coleman Cowan is the producer. Super Bowl 50 is now safely in the books…. The Las Vegas sports books, that is, where more than $100 million is bet legally on the game. That money was dwarfed, however, by the billions spent last year on fantasy sports entry fees. Today, more than 45 million Americans play some form of the game. More than nine million are now competing in the high-voltage variation known as daily fantasy sports, creating mythical lineups of professional athletes, then living and dying with their performance on the field – hoping they tally enough touchdowns, assists, or goals – to win bragging rights, or a very big check. 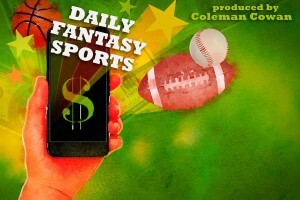 Less than a decade old, daily fantasy sports is controlled by just two companies – Draftkings and FanDuel – which now find themselves in the crosshairs of New York’s Attorney General, Eric Schneiderman, who says the games are illegal, and has filed a lawsuit to ban both companies from operating in his state. Now, for the first time since the case began, you’ll hear from three of the biggest players in the game, including the attorney general, in what’s turned into a high-stakes fight for the survival of daily fantasy sports.